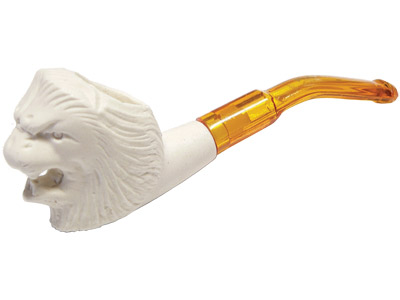 This mini meerschaum tobacco pipe is hand carved, has a lion design, and averages about 4" in length. Meerschaum is a type of mineral mined primarily from the plain of Eskişehir in Turkey. It is used mainly to make tobacco pipes and small, carved gift items. It's popularity as a material for tobacco pipes is based largely on how easy it is to carve and that meerschaum has virtually no taste. Many of the smaller meerschaum pipes on the market are made from pressed meerschaum. This is basically the meerschaum scraps and powders that are left over from the production of larger pipes which are mixed with binding agents and then compressed. All of our pipes, regardless of size, are made from solid block meerschaum which means that it is carved from an original, solid chunk of meerschaum. The disadvantage of pressed meerschaum is that it cracks and chips easily, especially the threaded portion where the stem screws in. Each meerschaum tobacco pipe is hand carved so their design will vary.